In this article, we will explore the basis and the future implications of this major transition. We will focus on two applications in particular: agriculture and last mile delivery. In this article we draw from two of our recent studies: Agricultural Robots and Drones 2017-2027: Technologies, Markets, Players; and Mobile Robots and Drones in Material Handling and Logistics 2017-2037. These detailed reports offer a comprehensive technology and market assessment, considering how robots and drones are penetrating into agriculture, logistics and material handling. In our report Mobile Robots and Drones in Material Handling and Logistics 2017-2037, we have built a model looking at the cost competitiveness of last mile delivery robots. We estimate the operator-to-fleet-size ratio at which mobile robots become more competitive than a man on a bike. This threshold is difficult to achieve given the current retail prices for early adopters of this robot technology. The forecasts in our report Mobile Robots and Drones in Material Handling and Logistics 2017-2037 suggest that the sales of ground-based last mile delivery robots will be modest until 2021-23. In this early phase the industry is essentially in learning mode and the activity will be limited to trials or modest sales for use in sparse and highly-structured environments. The growth phase will then commence. In this phase, the robots will also become increasingly ready to handle more crowded environments and their speed of travel and navigational technology will significantly improve. The unit sales boom and the hardware product will become commoditized. 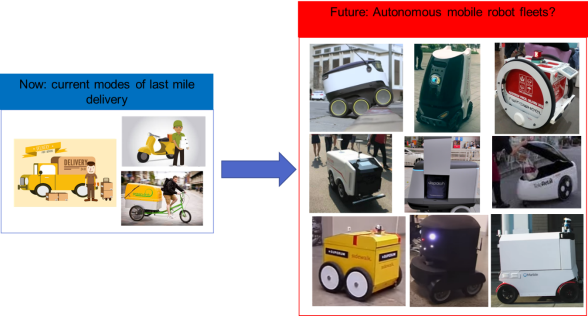 This way we will witness the rise of fleets of small-sized last mile delivery robots. The rise of autonomous mobility may also enable another type of agricultural vehicle that might also at first seem like a strange creature: the small, slow and lightweight agricultural robot (agrobot). These robots are evidently less productive than a larger vehicle therefore you might wonder why are they being seriously considered by players large and small around the world? Fleets of small agrobots will go further in that they will enable site-specific or even plant-specific ultraprecision farming. These slow-moving robots will give each site the customized attention that it needs all the way from planting to harvesting. This would be akin to industrialized gardening. This will boost yields and will also significantly reduce chemical use. Furthermore, these light robots will cause no soil compaction and will drive down energy consumption, emitting no noise and CO2 since they are electrically powered. For further information please refer to our report Agricultural Robots and Drones 2017-2027: Technologies, Markets, Players. This report develops a detailed roadmap of how robotic technology will enter into different aspects of agriculture and how it will change the way farming is done. It will consider many applications and technologies including static milking robotics, mobile dairy farm robots, autosteer tractors, autonomous tractors, unmanned spraying drones, autonomous data mapping drones, robotic implements for de-weeding, autonomous de-weeding mobile robots, robotic fresh fruit harvesting, robotic strawberry harvesting, manned and unmanned robotic lettuce/vegetable thinning/harvesting and so on.